Well, I thought I knew a thing or two about high teas. I've tried almost every cream tea from Devonshire to Scotland, and even a fabulous trolley-laden affair at a castle in Ireland. I have slavishly worked my way through Melbourne's magnificent high teas at places like the Windsor - such devotion to duty! 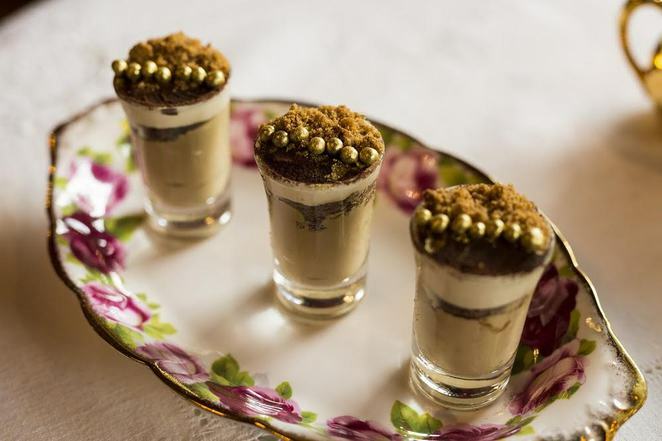 However, all of these delicious treats pale in comparison with the extravagance, taste and sheer indulgence of a high tea at the Mamor Chocolates and High Tea Szalon in Johnston Street, Collingwood. Walking into the shopfront from busy Johnston Street feels like falling through a time machine into a lush nineteenth century parlour - there is red and gold everywhere - plush red velvet divans, gold flock wallpaper, elegant gold trimmed tea sets, crystal chandeliers: nothing about the rooms shouts modesty or restraint - and it's absolute perfection. You are greeted at the door by the gracious and glamorous host/'chocdiva', Hanna Frederick, who, along with husband Dr Howard, makes you feel like the most important person in the world as she ushers you to your divan and table, set with the most delicate tea settings. Champagne is quick to arrive and then comes the real reason for coming: a really unique and absolutely delicious feast, including hands-down the best scones I have ever tasted (the secret is Hanna makes them just before you arrive and they are made with cream and not butter). There is a perfect balance of savoury and sweet delicacies, and the sweetness is tempered so that you are never left feeling that things are just too rich. A plate of fruit helps cleanse the palate before the coup de grace is presented: decadent Somlo sponge cake. The sourcing of the ingredients which goes into each bite is done with great care and thought. The Fejoia jam which accompanies our scones for example, is sourced from a tree is a friend's garden. When chocolates are scented with lemon grass, Hanna sources the fresh product from farmer's markets, and distills the essence herself - this is where her background as a PhD in food chemistry really comes to the fore. Oh - did I mention the chocolates?! Yes - the chocolates are divine. Made by Hanna with passion and joy in her dedicated chocolate kitchen at the back of the salon, they shout about her understanding of chemistry and food and her creativity: Rosemary and Sea Salt is the hands-down winner for me, but it's a tough gig, with an extraordinary range including kangaroo salami dark chocolates (Seriously. My son loved it); strawberry and black pepper, chocolate dipped Mildura oranges (which Hanna dries herself), absinthe and anise, green tea wasabi, pumpkin pie, a mysterious 'aphrodisiac' chocolate, rosewater cardamom and the crowning glory: an extraordinary brandied sour cherry in dark chocolate which you have to drink before you eat. It's true - I was in heaven. 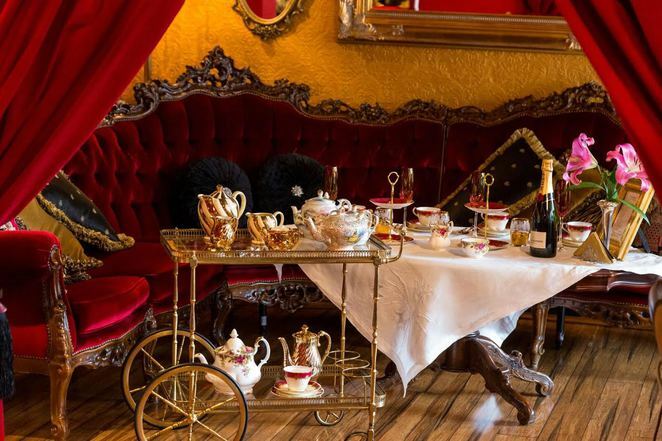 The high tea is accompanied by champagne, a thoughtful selection of specialist teas, including a delicious local Victoria chai, brewed coffee and espresso. For those without a sweet tooth (are you kidding, me? 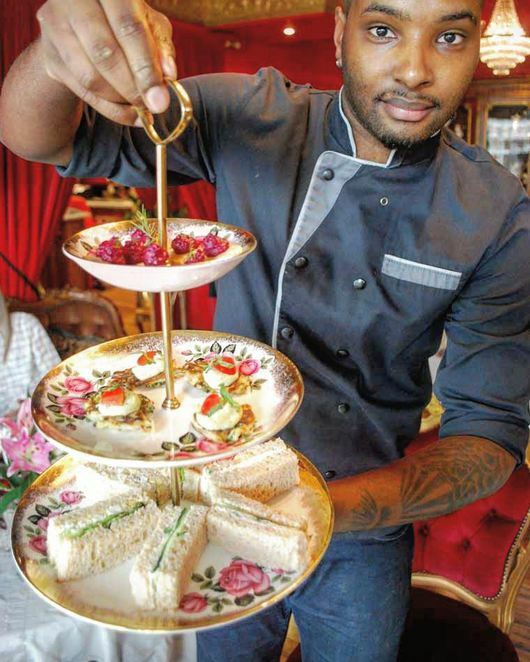 ), Szalon Mamor will soon be offering pre-booked brunches in addition to the high teas. They also do a rather unique evening on the last Friday of each month with a connoisseur beer and chocolate pairing evening - reservations are essential for this in-demand event, which was a hit at the 2012 Good Beer Festival. High tea is $65 per person weekdays and $75 per person weekends. Bookings are essential, though on weekends, if you are lucky, you may be able to find space for a walk-in mini chocolate high tea ($25: scones, chocolates, tea), though it's best to call ahead to avoid disappointment. Hanna welcomes function/group enquiries and is happy to discuss menus. Szalon Mamor is one of those places you (and your tastebuds) will regret forever if you never get there - an extravagant sensory overload that everyone should experience at least once. But good luck with just stopping at once! When: Opening times are 11-5pm Wed-Sunday, bookings essential. Hi Julie, just wanted to let you know that on the strength of you article I have booked my mother's 92nd birthday here. When I rang to make a booking they asked where I had heard about them. I told them "Weeekend Notes." The lady seemed very pleased that the article had brough them some business. Regards Nadine. Thank you - I am looking for a high tea alternative to the Windsor (a.friend went recently and was very disappointed. Szalon Mamor sounds divine! Ooh I like a cosy venue with charm & character. Do you think this venue would be ok with kids or is it more for adults only? You mention your son was with you, is he little?